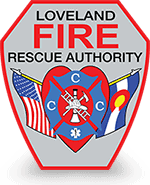 Home/Community Safety Division/LFRA Firefighters Rescue Horse from Ice – Watch the Video! LFRA Firefighters Rescue Horse from Ice – Watch the Video! The horse’s name was Patch and she is 25 years old. She ended up getting out of her stable and wandered onto the ice. It was nearly impossible for her to continue walking on the ice as her hooves didn’t have any traction and would keep sliding out from underneath her. We asked the owners to bring over one of Patch’s buddies named Linx to help calm her down, basically so she could see that her buddy was on the shore, and that is where we were bringing her. With the help of six firefighters dressed in ice rescue suits and 12 others on the shore, we place a section of hose around the horse and while she was laying on the ice we drug her to the shore. From the shore she was able to stand up and walk up to where her owners and the veterinarian to take a look at her. Patch was uninjured. Luckily enough the ice was thick enough to support a horse (approximately 1200 pounds) and several firefighters standing around her. 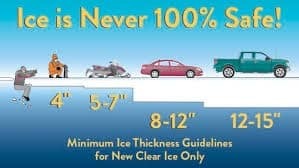 As reminder, do not assume that the ice is thick enough to support your weight. If you are unsure don’t go out on the ice!